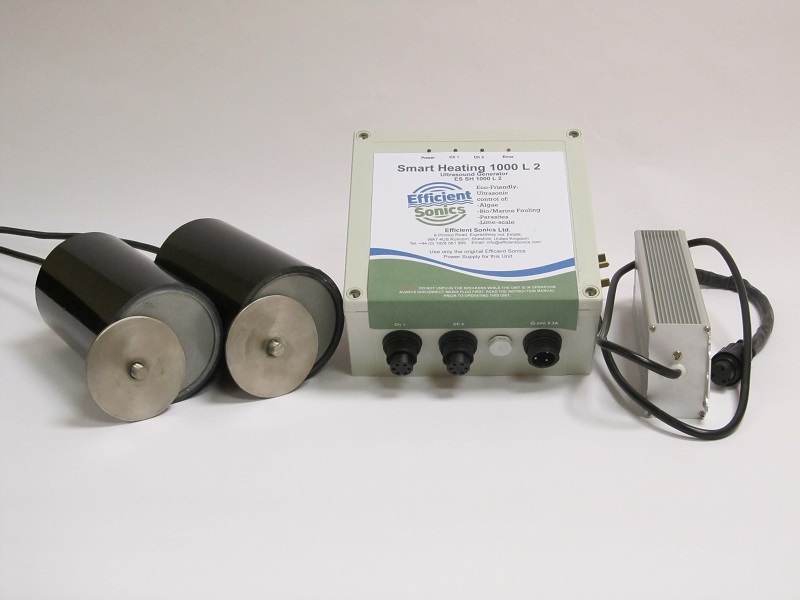 Smart H 1000 L 2 | Efficient Sonics Ltd. The Smart Heating 1000 L 2 is an eco-friendly and reliable solution for safeguarding your Industrial Heating System and Boiler of up to 1500 litres capacity, from the expensive damage caused by lime-scale deposits. This model comprises a single control unit with two outputs of 25 Watts, and two large transducers which can be used independently to target different sections of the heating system, together with a mounting kit and mains power supply, 24 Volt, Mains AC version: 170 V to 240 V ac, 50 or 60 Hz, or: 100 V to 120 V ac, 60 Hz. The Smart Heating 1000 L 2 has the unique Smart Tune Technology, which automatically re-tunes the system for optimum performance every 6 hours, or other interval as requested.